Well, this one is far from being verified, but Latino Review has reported that Pixar has been tasked by Disney to create the next Star Wars film. As Latino Review puts it, they have heard that Pixar “has been given their own Star Wars movie.” No details regarding the subject of the film, the timeline, or anything more are yet available. Disney acquired Lucasfilm in 2012 for $4 billion, so let’s hope they begin leveraging the talent at Pixar to a greater extent and the Star Wars franchise could be a great fit. We know Disney has announced plans to reinvigorate the franchise, beginning with Episode VII in 2015. Following that, Disney will begin releasing new Star Wars films each summer. In 2017 it will be Episode VIII and in 2019, Episode IX. In the years between, 2016 and 2018, Disney will release “spin-off” movies, each focused on an individual character in the Star Wars universe. 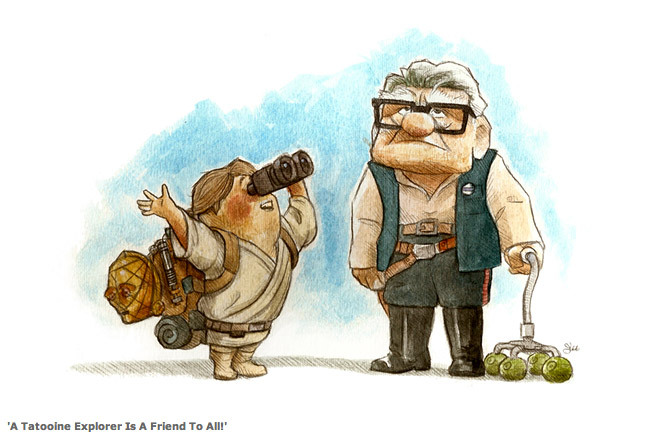 Thanks to James Hance for the wonderful Up/Star Wars mash-up illustrations. Visit his site for more and to purchase prints and t-shirts.